I am fighting my way back through the weeds of my desperation and helpless feelings to find the words. I am propelled by the message that has been pulling at my heart. It is hard work. I don’t know how to process the senseless loss of life that took place less than 24 hours ago in Parkland, Florida in yet ANOTHER school shooting. I am really not feeling right. Not at all. 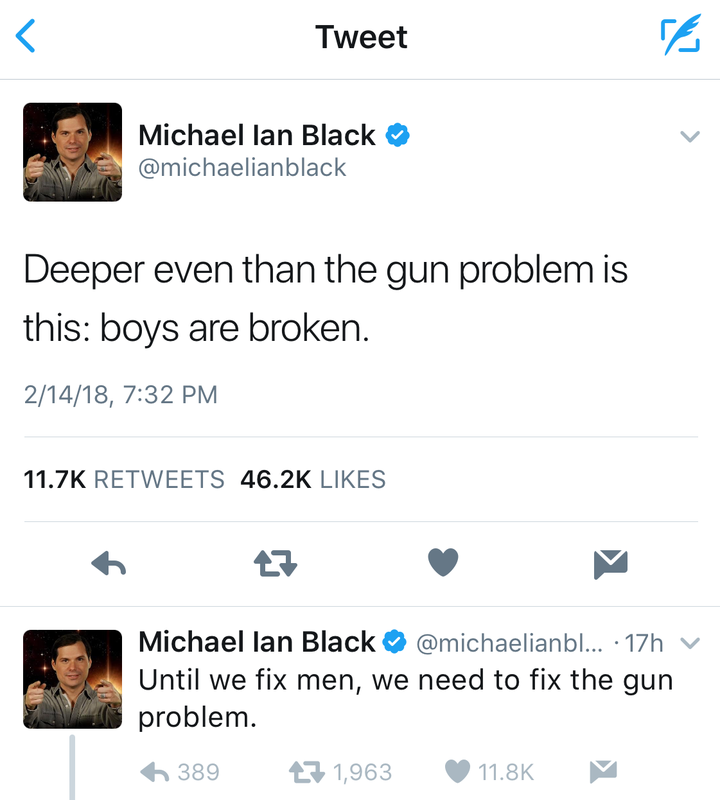 Then I read this tweet from Michael Ian Black that lit the way. I know what Michael means but I can’t seem to connect the dots. How can the same school that expelled the Parkland school shooter also enroll David Hogg? How does THIS WORLD make room for both my inclusive, intersectional feminist son, fighting for social justice, AND men who choose money and power over responsibility, in blatant disregard of the lives of millions of children? Men can be gentle and kind… and heroic. 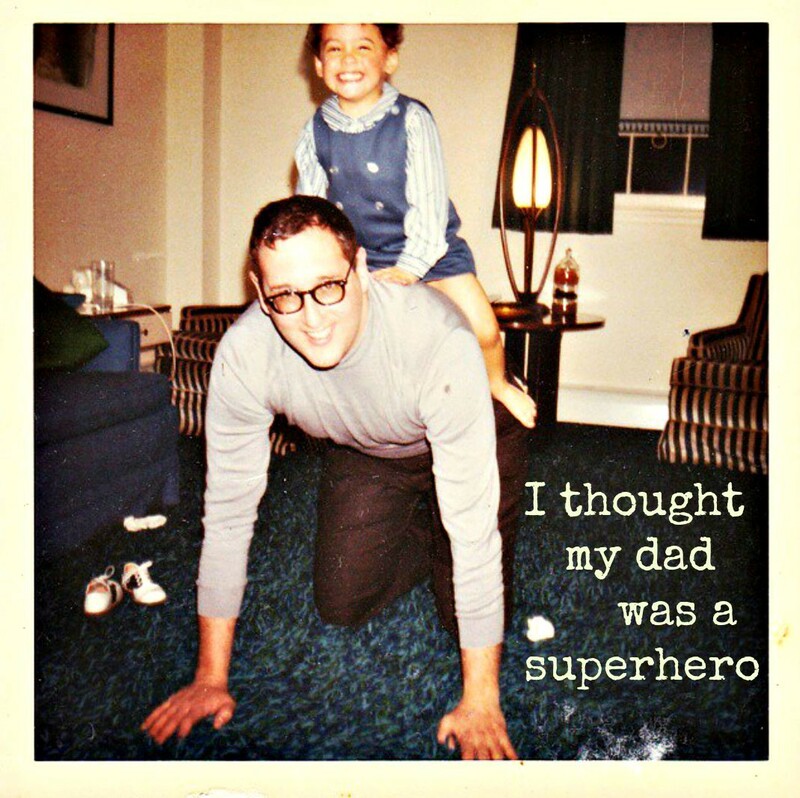 Once upon a time, I thought my dad was a superhero. My father was a gentle giant but his examples of how to be a man came from a generation who saw expressing emotion as dangerous. Only two generations later, I am friends with dads who can be emotional and share a deep connection with their kids. And together with a generation of women who are courageously speaking up about their struggles with sexual assault and bias, we are raising a generation of caring, compassionate young men who will lead us forward. Yet we are still plagued by toxic masculinity in our boardrooms, locker rooms, bedrooms, and Oval Office (there I said it). The aftermath of the second largest school massacre since Sandy Hook in 2012 (26 students and staff shot dead with the same brand of weapon) reminds us that we can’t even keep kids safe from angry young men with guns. I remember my fear and sadness nearly 20 years ago, just beginning my career in education, when two boys in trench coats shot up their high school in Columbine, Colorado. Over the last 20 years, Columbine has been replayed again and again in a pattern across the country. We try to protect students from gunfire. We fail. Politicians and citizens argue over how to prevent it from happening again. Nothing changes. It happens again. The cycle of emotion, debate, and inaction repeats. What seems simple is maddeningly impossible. Why can’t we prevent the next school shooting? 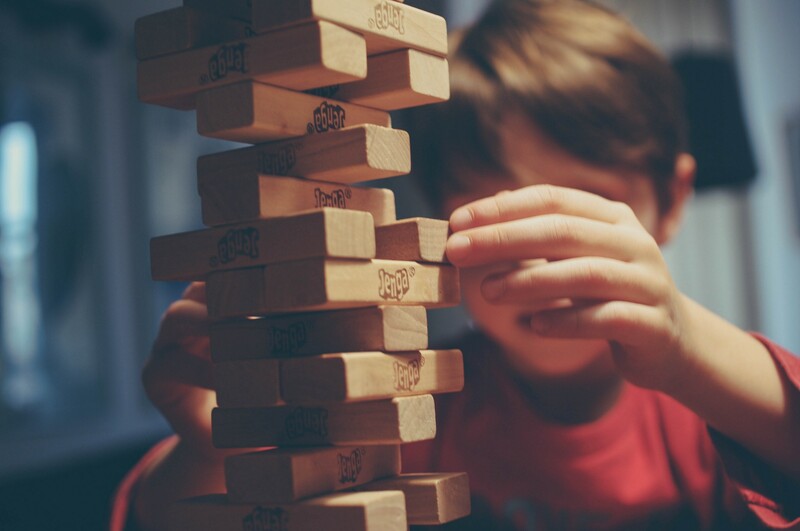 The risk factors (early aggression, social difficulties, isolation, depression, learning problems) are EASY to recognize. The question is what we do with that information. And when I say, “what we do,” I mean WE (as in ALL of us, not just “the professionals”) and DO (as in preventively). We know what to do. OK, let me clarify that. The experts know what to do. I know what to do. We have tools for prevention, to catch problems in formation, when kids are young. But they sit on the shelf. We don’t use these tools because we can’t find a way to make time in the “instructional day” to develop students’ “soft skills” or to dedicate staff and energy to school climate initiatives. Over those same 20 years full of tragic gun violence in schools, I have taken deep dives into Appreciative Inquiry, Restorative Practices, Trauma-informed Practice, and Positive Psychology. I have studied ways to ensure children’s mental wellness, protect them from isolation, build community, and grow their character strengths. For instance, Restorative Practices (RP) is a set of community-building practices that can be adopted by a classroom teacher, a whole school, or a district. RP avoids the mistake of treating individual kids or bullying incidents in isolation as THE problem. They embrace the flashpoint as a symptom of a larger issue. You may not have heard of RP or Positive Psychology (yet) but these are the kinds of ideas that are spreading. If you don’t work in education, what can you do? As a Positive Psychologist, this is where I would suggest you begin: Use whatever skills you have to create something. Add some of your creative, positive energy to the world. Don’t spend your energy arguing with people who “don’t get it.” Let them do them. You do you. We NEED you to do you. We need you to generate more positivity if we are going to change the ratio. Start a new conversation. Raise someone up. Flex your superpowers of love, kindness, and generosity. If you want to get more scared or depressed, focus on what scares and saddens you. If you want to feed the good that is growing in this world, put your shoulder to the wheel that creates hopefulness and connection.